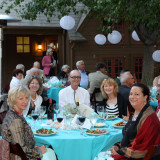 Holly organized the Wildling Art Museum’s major fundraising galas from 2004-2010. 2010-2012, she continued to be involved in the planning process, graphic design, marketing, and web content of the events. This one evening event generally drew approximately 100 people, and involved auctions (silent and live), live music, catered dinner, and presentations. Project Scope: Collaborated with events committee and Executive Director on themes, ticket price, and fundraising objectives. Creation of invitations/rsvp packets, marketing, web content, sales, coordination of volunteers, contact and coordination of event venue, rentals, caterer, and oversight the evening of the event – including check-out. Follow-up included accounting of monies received, distribution of auction items, and review of event.